Image: google research blog reports that "neural networks that were trained to discriminate between different kinds of images have quite a bit of the information needed to generate images too." In this outstanding paper, Google reports that "The techniques presented here help us understand and visualize how neural networks are able to carry out difficult classification tasks, improve network architecture, and check what the network has learned during training." This understanding raises question about the human condition. The article concludes by saying that "It also makes us wonder whether neural networks could become a tool for artists—a new way to remix visual concepts—or perhaps even shed a little light on the roots of the creative process in general." I believe that the act of transposing is a fundamental survival mechanism of the mind, not only a creative one. The process of my Natural Disaster Color series is a reminder that, as humans, we are constantly processing and transforming that which we experience -- hopefully for better. 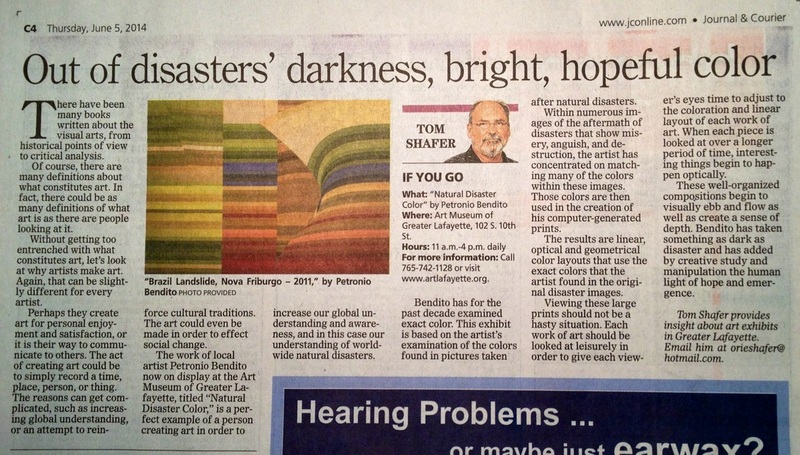 "Out of (natural) disasters' darkness, bright, hopeful color" by Tom Shafer. LOWELL, Mass. 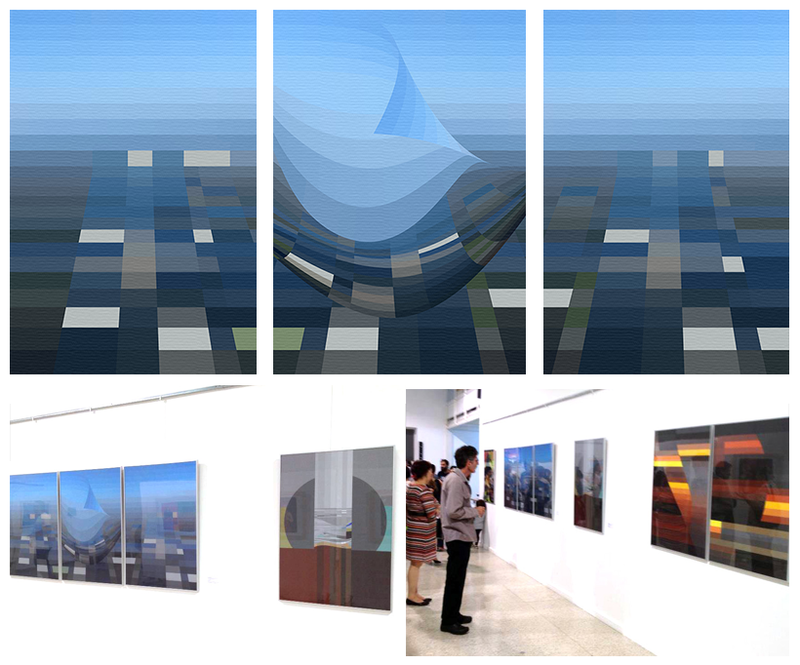 -- From September 23- November 1, digital artwork from across the country is on view at LTC's downtown gallery. 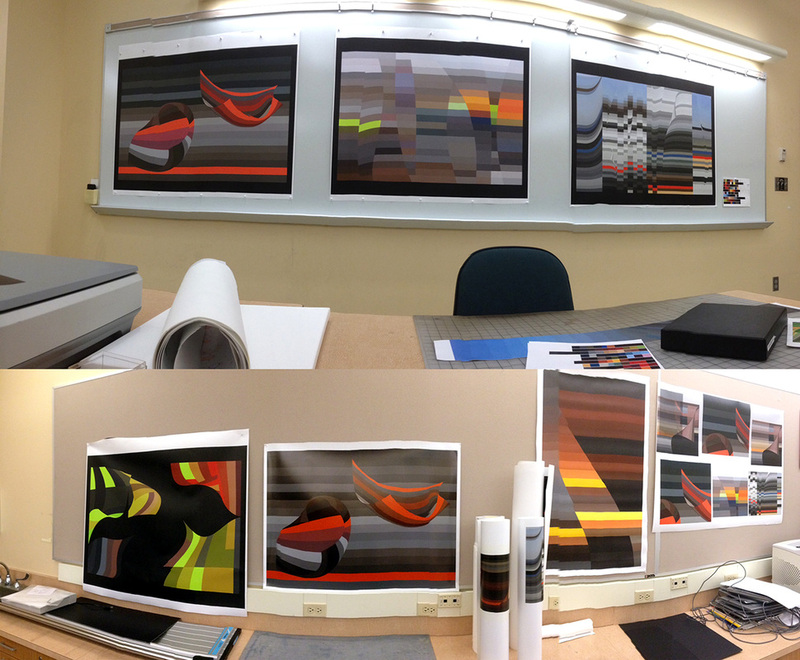 The show, entitled Digital Art: Printmaking 2013, is part of Lowell Celebrates Printmaking, a city-wide exposition in conjunction with the Boston Printmakers Biennial. The show features work created in a number of digital platforms, blending art made using photographs, programs such as Illustrator, stills from video animation, and more. The result is an array of art that takes everyday images and turns them on their heads. LTC's goal in putting this show together was to showcase new techniques in the traditional craft of printmaking. The show was juried by Jim Jeffers, an intermedia artist and designer working with computer mediation, web-art, performance, photography and video in conjunction with conventional media. Jim teaches, exhibits and performs across the United States and internationally. His most recent post was as Assistant Professor of Art & Design at UMASS Lowell. 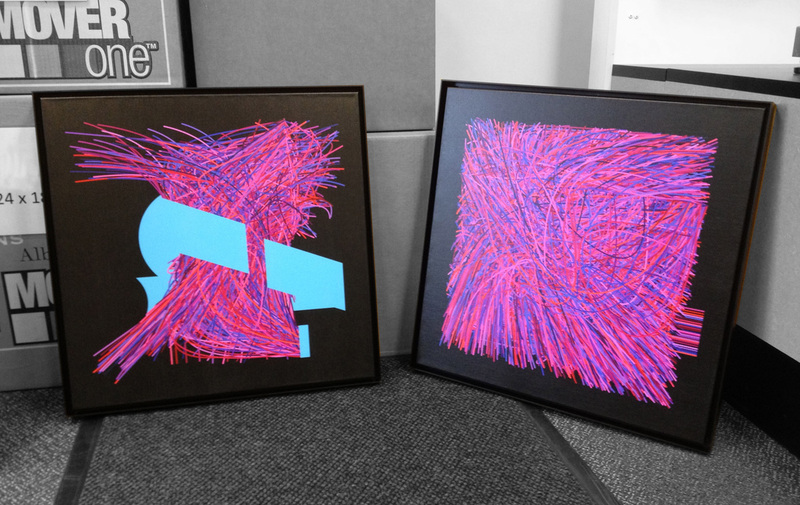 The best in show prize was awarded to Petronio Bendito for his work, Color Code 0025: Algorithmic Lines. Honorable mention was awarded to Patty Harris for her piece, Case Study No. 21_1. Artists featured in the show include: Stephen Clements, Eileen Ryan, Dan Rocha, Mari Weinberg and Noredin Morgan of Massachusetts; Petronio Bendito of Indiana; Robert Spahr of Illinois, Cyane Tornatzky of Colorado; Patty Harris of New York; and Daehwan Cho of Idaho. Digital Art: Printmaking 2013 is one of 8 printmaking shows featured in Lowell as part of Lowell Celebrates Printmaking. This is the only show to feature digital art. Other participating Lowell galleries include: 119 Gallery, ALL Arts Gallery at Gates Block, American Textile History Museum, Ayer Lofts Gallery, Brush Gallery & Artists' Studio, Whistler House Museum of Art, and Zeitgeist Gallery. Carl Jung reminds us that "becoming is a choice!" QUARTET features the Natural Disaster Color series by Petronio Bendito in conjunction with works from three other artists. A video by the Visual Resource Library, Rueff School of Visual and Performing Arts, Purdue University (2013). Faculty exchange exhibition featuring work by two faculty members from Eastern Mediterranean University in North Cyprus and two faculty members from Purdue University. The exhibition examines the peculiar possibilities of visual design and photography within broader multidisciplinary contexts and processes, while providing a platform to cultivate international academic and cultural exchanges. The exhibition includes work by artists Senih Cavusoglu and Umit Inatci from EMU, North Cyprus, and associate professor Petronio Bendito and assistant professor Min Kim Park from Purdue. Writer Rachel Wolff captures the impact of natural disasters on art processes in this revealing article. The article discusses how "personal loss has become subject and challenge for artists hit by disasters like Sandy and Katrina." Historically, artists have reflected on their lived experiences through their practices and offered us new insights about the human condition. CULTURAL WORKER: In preparation for the upcoming QUARTET exhibition, USA edition, at Rueff Galleries, Purdue University. The exhibition features works by Petronio Bendito (Natural Disaster Color series), Min Kin Park, Senih Cavusoglu and Umit Inatci (http://www.cla.purdue.edu/RueffGalleries).